Men's Wooden Inlay Silver Ring : LOVE2HAVE in the UK! 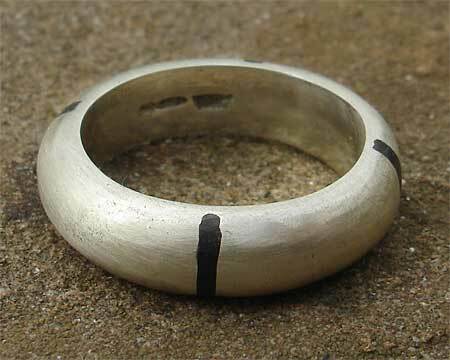 A men's wooden inlay silver ring. 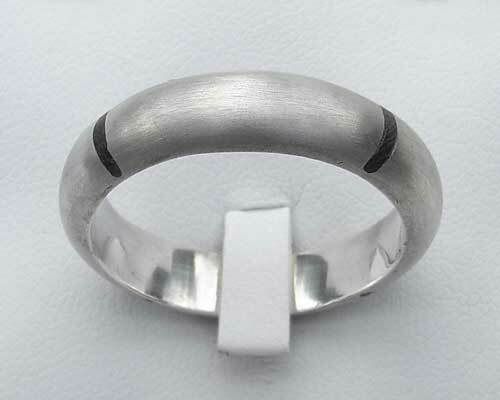 This ring is a D-shaped profile silver ring set with inlaid strips of rosewood. The shaping of the silver does, in fact, make it quite chunky, measuring just over 2.5mm deep. The width measures 6mm. The inlays come set across the width of the ring. There are four of them, and they come separated equally from one another sitting one-quarter distance. The inlays are all 1mm wide. The finishing to this ring is matte and again has a lovely handmade quality to its styling. A great wood inlay men's ring. PLEASE CONTACT US FIRST IF YOU INTEND TO PURCHASE THIS RING AS SOMETIMES THEY ARE NOT ALWAYS AVAILABLE.